Strong thunderstorms that brought more than an inch of rain Thursday, ended days of record high temperatures. The National Weather Service and the Community Collaborative Rain, Hail and Snow Network said Norwalk received 1.87 inches of rain; New Canaan, 1.81; Fairfield, 1.42 ; Wilton, 1.28; Tweed-New Haven Airport, 1.26; Madison, 1,14; Milford and Seymour, .95 of an inch; Bridgeport, .91 of an inch; Darien, .83 of an inch; Westport, .82; and Monroe, a half-inch. The thunderstorms, trigged by a cold front, dropped temperatures nearly 20 degrees over in a three-hour period. Sikorsky Memorial Airport’s high temperature was 92 degrees just before 3 p.m.; by 6 p.m., the temperature was 73. The NWS said “a frontal boundary will remain south of Long Island through the weekend. A few weak disturbances will track through the area today and tonight producing some light rain. After that, there’s a big question of what track Tropical Storm Florence will take over the next serveral days. The storm is located more than 900 miles east of Bermuda, and forecasters said it was too early to say what, if any, hazards it may bring to the U.S. coast. Computer track models so far disagree on a future track, raising uncertainty about its path next week. However, they still expect Florence to remain a dangerous hurricane and said it’s likely to regain intensity as it churns west. 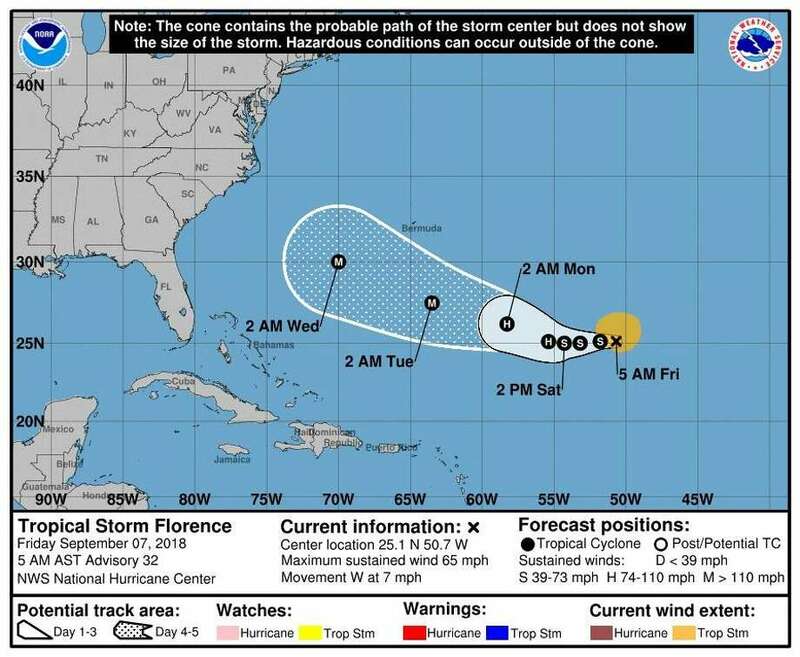 At 5 a.m. Friday, the National Hurricane Center said Florence had weakend with winds down to 65 mph, The NHC expects it to strengthen over the weekend. As the season reaches its peak, two other systems off the African coast also continued to look more likely to become tropical depressions. Friday: A 20 percent chance of rain. Cloudy, with a high near 77. Northeast wind 8 to 10 mph. Friday Night: A 20 percent chance of rain. Mostly cloudy, with a low around 61. Light and variable wind becoming north around 6 mph after midnight. Saturday: Mostly cloudy, with a high near 73. Northeast wind 10 to 13 mph. Saturday Night: Partly cloudy, with a low around 56. Northeast wind around 10 mph. Sunday Night: A 30 percent chance of rain. Mostly cloudy, with a low around 58. Monday: Rain likely. Cloudy, with a high near 73. Chance of precipitation is 60 percent.